Thanks to Moumi M. for today's post! 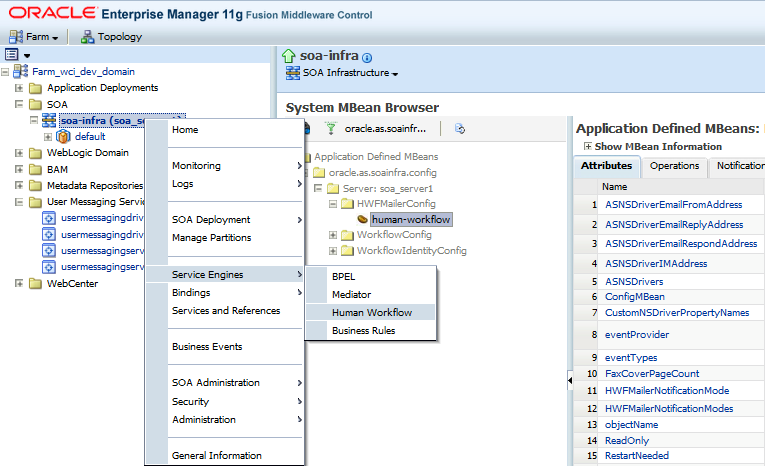 Oracle SOA Suite 11g supports a number of different notification channels through the User Messaging Service (UMS). 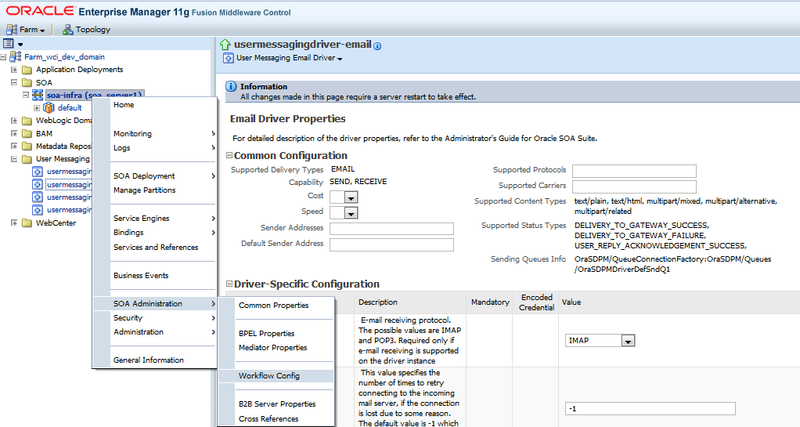 This blog provides a step-by-step guide for configuring and testing email notification. Before Enterprise Manager can send e-mail notifications, you must first specify the Outgoing Mail (SMTP) servers to be used by the notification system. 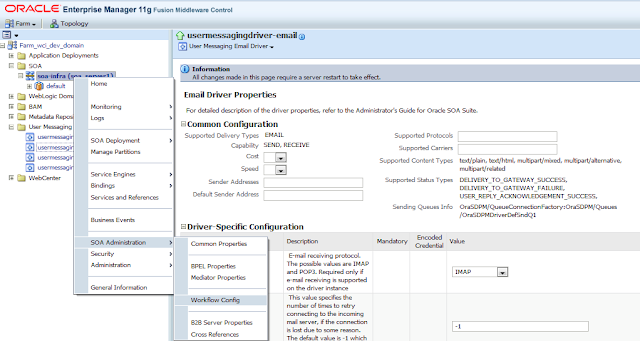 Once email notification has been configured, emails can be sent from SOA Suite components such as BPEL processes and Human Tasks. It is useful for the business case scenario where any invoice will send to Rescan or Supplier Maintenance group for further approval processes, users are assigned under Rescan or Supplier Maintenance group , get an email-notification after configuring the below mentioned steps. 1. First we need SMTP server details, not IMAP. 4. Click Apply to save the changes. 5. 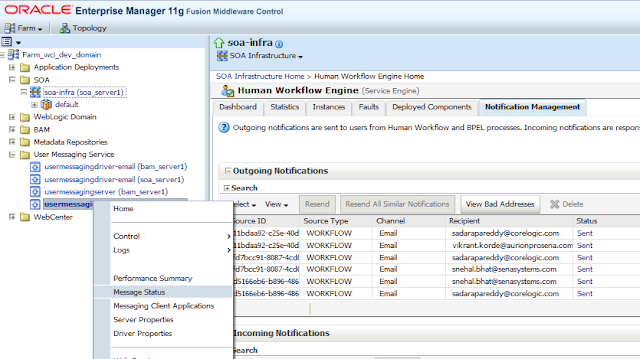 Right-click on soa-infra under SOA and navigate to the Workflow Notification Properties page available under SOA Administration. 6. Set the Notification Mode to 'Email' and enter the default values which you wish to use for from, actionable and reply to email addresses. 7. Click Apply to save the changes to the workflow notification properties. 8. Restart the SOA server for the changes to take effect. If you are using Gmail or any other mail server that requires SSL you will need to perform extra before restarting the server. Now that we have configured outbound email notification, we want to test our configuration easily without having to create a BPEL process or human task to do this. 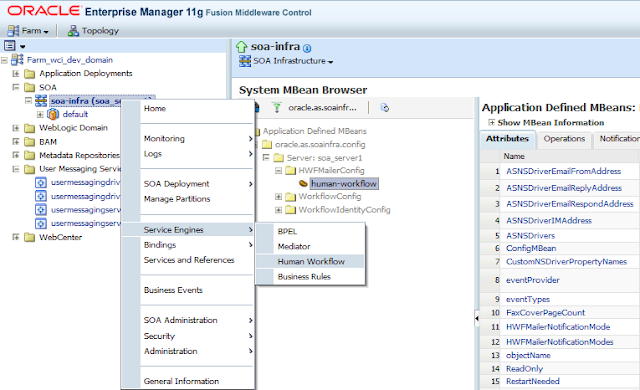 Fortunately, we can do this from Enterprise Manager Fusion Middleware Control. 1. 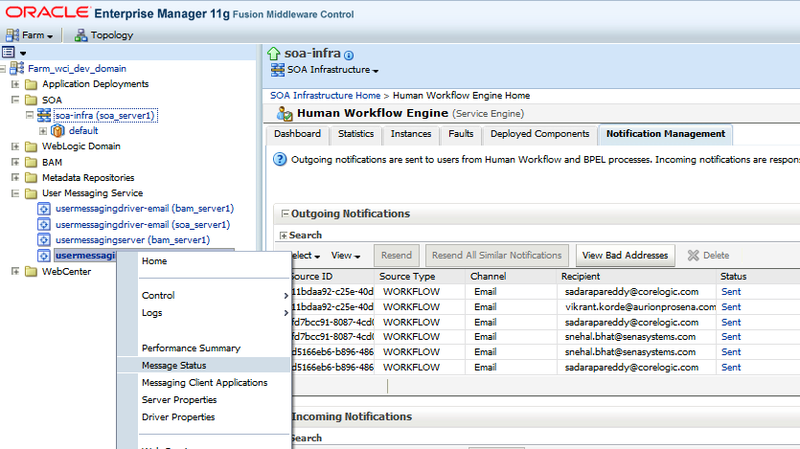 Right-click on soa-infra under SOA and navigate to the Human Workflow page available under Service Engines. 2. Select the Notification Management tab. 2.2. The Send Test Notification dialog box should now appear. Enter the email subject, content, to address and be sure to select 'Email' for the channel. Click Send. Once the email has been sent, you should receive a value of 'SENT' for Response. You can now close the dialog box. 3. Ensure that the email has been received. 4. Other way to cross-check the status of the mail after right-click usermessagingserver (soa-server1) > Message Status, same way user can again check if the message was sent or not. 5. When assigned user receives an email, he must click on the ‘Imaging Application’ link and check the proper solution namespace is configured and that will redirect to proper Tasklist Login Page. I wanted to continue part 2 of the Capture 11g review with some practical examples. The focus will be on "Client Profiles", which are the new container for the end-user interaction with the system. We'll start with a review of Client Profiles and their purpose, then we'll go into creating the individual assets that makeup a client profile. These are some typical, basic examples that should be very to relate to the 10g experience. You can find the documentation for Client Profiles in section 4 in this document. and required, and what happens next to batches after users release them. In other words, a 'client profile' is the top-level container for end users. You can see how the client profiles are used by the end users in the above screenshot. 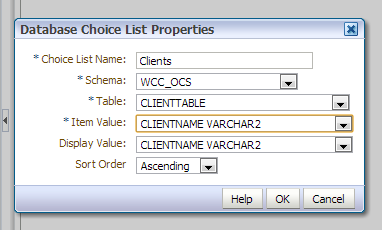 Changing the client profile changes the available items in the batch list area. Now that you know what we're going to create, let's start building one. Since I want to present an end-to-end example, let's start with creating the top-level container on the administration side. 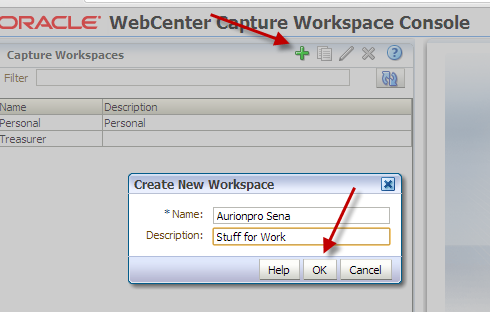 Note that capture admins are WLS administrators (with appropriate roles) as well as users with the CaptureWorkspaceManager application role. We'll cover security in more detail in an upcoming article. At this point, the workspace is created. It's time to populate it with our commit, index, input, metadata, and other assets. The general purpose of this workspace will be to ingest work items. 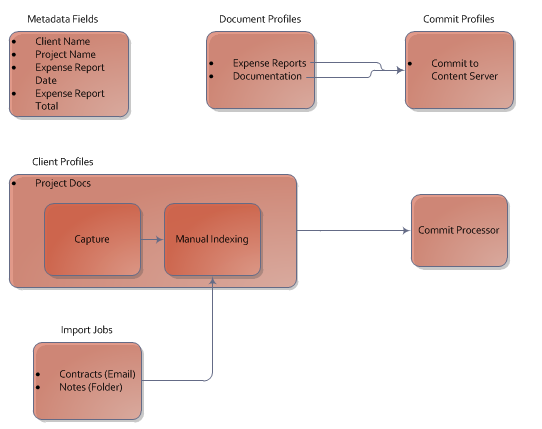 Specifically, we'll be processing expense reports, contracts, and other project documentation. We want to manually index all items, regardless of how they're captured. For this example, we'll create a system that allows for emailing contracts, dropping notes into a watch folder, and using the scanner (or file system) to capture any sort of project document. 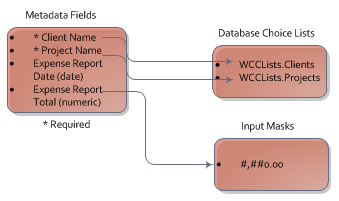 After indexing, the index user will be able to release each batch to be committed into the back-end WCC server. The security of this workspace will be fairly simple. We'll do everything as the admin for this sample. Let's start with the Database Choice Lists table. Note that this is a bit different. You don't 'add', as you may expect, but instead you 'edit' the default Database type that's pre-loaded. Repeat the above for the Projects table, which will be dependent upon the client table. Now, ideally, we'd create a DCL (dependent choice list) that would replicate the behavior that we have in WebCenter Content. That is, the children can all come from a single table, filtered by the parent value. 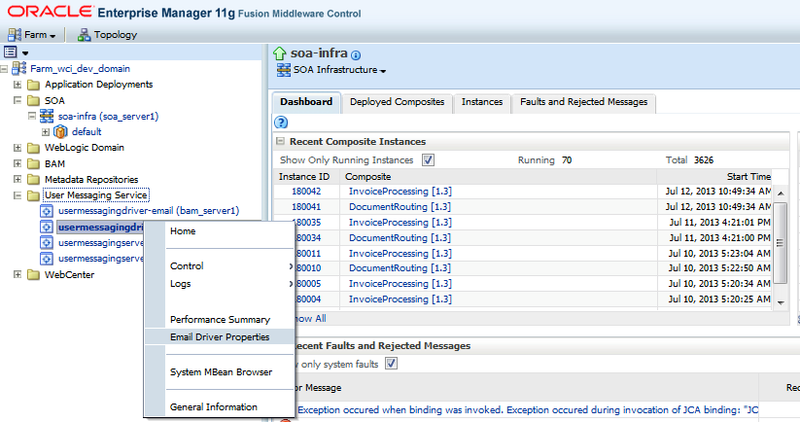 This still does not appear possible in 11g out of the box configurations. With 11g, the DCL capabilities is similar to the 10 DCL functionality. See section 3.7 in the Managing Capture guide for full details. 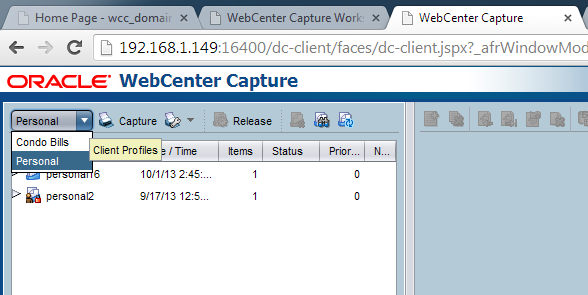 The downside of this framework is that we still cannot (in)directly leverage DCLs defined in WebCenter Content. Each Capture parent value will re-populate the child value with an entire list opposed to a filtered list. Continuing with this example, we'll simply have two, unassociated drop down lists. Next, now that the metadata data sources (database choice lists, in our case) are defined, we can create the metadata fields. To create the metadata fields, we'll move up to the top table on the Metadata tab. This is the "Metadata Fields" table. Fairly simple process, but you do have the options to configure these fields with masks, regex validation, and some other more advanced options. Comparing this to 10g, you'll notice that, instead of creating the fields attached to a file cabinet with only the most basic attributes (name, datatype, length), you now create the full definition at the top level. To allow the user to enter decimal values, you must create a format that forces at least one decimal (#.0#).For client users to change a number's sign, they must enter the number first, then press the + or the - key. By adding this mask, we're allowing (and enforcing, in this case) the use of a double datatype. The next step will be to create the needed document profiles for this workspace. 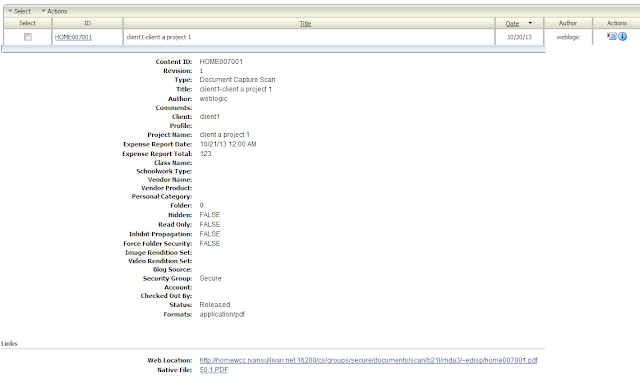 This occurs within the Classification tab under the Document Profiles table. Fairly simple process. Repeat the above for the "Documentation" profile, but don't select the two expense report fields. Comparing this to the 10g method, you see that there are less options at the 'index profile' level. 11g removed index profiles and spread out the options a bit more. Keep this in mind to help understand the 11g context. It's time to start tying things together with the client profile. Switch to the Capture tab. There are two tables under this tab: Client Profiles & Import Processor Jobs. Let's start on the Client Profiles table. Note, on the "Document Indexing Settings" page there's a new option called "Document Creation Option". This allows the workspace manager to pre-define whether this client profile will be scanning in Simplex, 'Duplex', Variable, and user-prompt mode. Simplex will create a document per page scanned. The "2 - Two Pages (e.g. 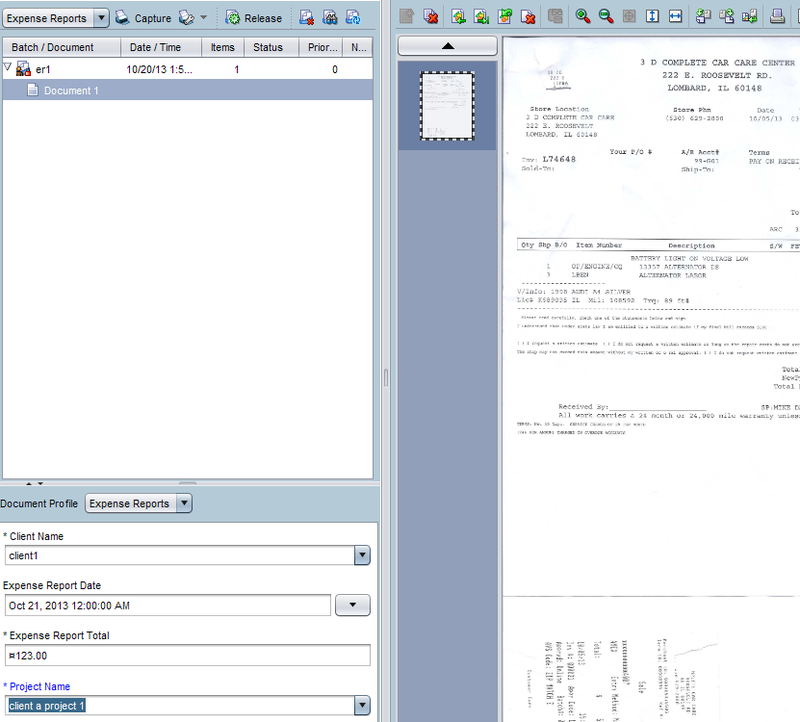 Duplex)" option makes it seem that this is for duplex scanning, but it's more geared for two-page invoices. But, it's still the scanner's settings that determine whether pages are scanned simplex (front page only) or duplex (front & back). Keep this in mind while making your selection. The default is "Variable Number of Pages". This is similar to the 10g method that will scan in all pages into a batch and allows the user to break the batch into documents while indexing. The final option is "Prompt User". This allows the index user to select any of the three above options at scan time. The next step will be to create the needed commit profiles for this workspace. This occurs within the Commit tab under the Commit Profiles table. At this time, we are able to process a document. - NOTE: notice that the expense report total isn't throwing an error, but it's also not retaining the value that you entered. This is because you must select the correct datatype and display format. - - Return to your metadata settings and update the values for the Expense Report Total. Switch the Data Type from "Numeric" to "Float" and set the Display Format to "Currency". -- Now, refresh your client and you should be able to enter the expense amount without issue. At this point, you have a basic scan and index profile in 11g. 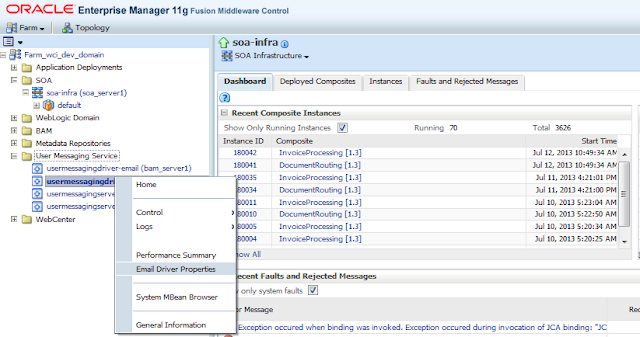 This process mimics the basic process of a simple scan and index profile in 10g. In the second part of Client Profiles, the other import options will be explored.